Those days; believe me, you’ll have them. Yesterday, We had one of those and we’re only two days into the new school year. Some may say that is to be expected and that may be true, but they are days you don’t want to experience. These and some other off color remarks can be heard, not often, sometimes in a homeschool day. Before you start to panic, or call the authorities or start a fund for the counseling or psychotherapy of my children, you must understand one thing. Homeschooling is a total different experience from traditional school (ex: public, private, school away from home). In a homeschool setting, children are in a familiar environment, which is more comfortable and safe and where they feel freer to “be themselves,” despite how attractive (or unattractive) and sometimes obedient (or disobedient) that may be. So as their mother and teacher I get it all. I get how they would respond to their teacher, which is what I want during school hours. On the other hand, I also get how they would respond to me as their mother, which you know can be quite interesting at any moment of the day, because they know we care. I could do without hearing those type of remarks, especially while I’m trying to go espouse wisdom and have a productive school day. “Why does Canyon get to play? Before River and Lily’s school day begins, they complete a critical thinking exercise. When I prepared their exercise for them, I saw fun, excitement and I smiled when I thought about their little brain cells getting a jump start on the day. Their activity yesterday was a Sudoku puzzle that I create using Edhelper. In the puzzle, they were given a number of shapes to fill into a grid, in a row and column manner, with no duplications in either. Sound hard? Not really, but it does make you think. I gave them age and grade appropriate puzzles and Lily just happened to finish hers before River. Let the drama begin. After spending a few more minutes on his puzzle, River was ready to be finished, except he wasn’t actually finished. There were empty squares on his grid that still needed to be filled. Well, it was taking very long and I was getting really tired and a little bit aggravated too. I considered letting him off and not making him do the work, but I knew as his teacher and also as his mother that he needed to continue, not give up and finish. He complained a little more; got to love his creativity – he gets it from me. Finally he decided to put his energy where it truly belonged and that was in completing his puzzle. 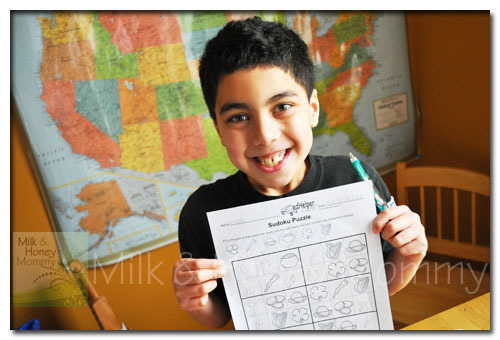 Along with this smile, after finishing his work, came an apology for his attitude as well as a great big hug. Have you ever experienced similar school days? Describe the moment(s) and I would also love to read some of the remarks you’ve heard so I will be prepared later. *For the school away from home mommies (public, private school etc. ), enjoy a good laugh at my expense. Regardless of the educational path you have chosen for your child, the most important thing you can do for them is just love on them really, really well! Check out all the great bloggers in the Crew blog hop! 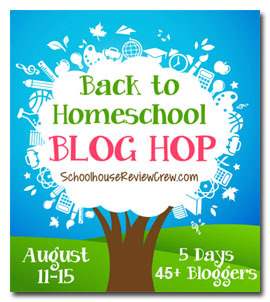 Several members of the Schoolhouse Review Crew (Including Milk & Honey Mommy) have joined forces during our August Back-to-Homeschool Blog Hop to bring you these incredible giveaways, totally more than $1,300 in homeschool curriculum and Paypal cash! In the Grand Prize Giveaway, someone will win $765 in curriculum, plus $150 in Paypal cash to help you finish up your homeschool shopping! You could win all of the following. 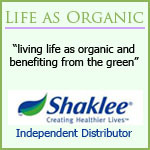 Please click on the prize links to learn more about each product. In the 2nd Prize Giveaway, someone will win $325 in curriculum, plus $100 in Paypal cash to help you finish up your homeschool shopping! You could win all of the following. Please click on the prize links to learn more about each product. To enter, use the Rafflecopter below. Residents of the U.S., ago 18 and older only. See more Terms and Conditions in the Rafflecopter. Writing (& arts and crafts time) time: Take the time to say ‘thank you’. There is something special about the two simple words thank you. I say them often, which sometimes may be a little too much, but my sincerity is there. Saying thank can go a long way, especially when they are a response for kindness that is extended to you. Along with composition, the writing of letters can be easily included into your homeschool lessons. Adding a course on writing or creating thank you notes may also be included. On Fridays, I allow my children to spend their own time writing on any subject that interests them. On Sundays, they spend their time writing letters to family members and friends. If it is after a birthday or around the holiday season when presents are received or exchanged, then they understand and are prepared to write thank you notes for the gifts they receive. When my oldest turned five, he had his first birthday bash where guests included more than just family. The many guests brought many presents and the day after the party, we started working on thank you notes for the cool gifts he received. I used construction paper and cut the cards into an interesting shape and he drew a picture of the gift and hand wrote a note specific for every gift received. We also took a picture of him using every gift and included it in the card. Needless to say, his penmanship improved and he gained a new appreciation for the gifts he received. It also reinforced that when someone extends an act of kindness towards you, then the proper response is to say or write thank you. Thank yous come in verbal form as well as in hand written form, but not as often as they should. It is easier to say thank you, than it is to write thank you, so most people opt for the former and call it a day. In some instances a verbal thank you is fine. Most people don’t expect to receive a written thank you note for holding the door open for you. Today, most people also don’t expect to receive a thank you note because not too many people send them anymore. If I give a gift to someone, then I do expect a thank you, but I don’t expect a thank you note. To clarify, I don’t give a gift to receive a thank you, but instead to show my appreciation for that person. When I do receive a thank you note, I’m grateful and also impressed because I know somewhere that person learned the importance of thanking someone for their effort; they were “raised right“. Besides building character, teaching your children to say thank you and also understanding the importance of writing thank you notes (etiquette 101) as well as when to send them, are values that will carry them through to adulthood. Their thank you note may bring needed comfort to someone. Think of how good you feel after receiving a thank you note. They may also be that remembered, and later hired, candidate after a job interview. 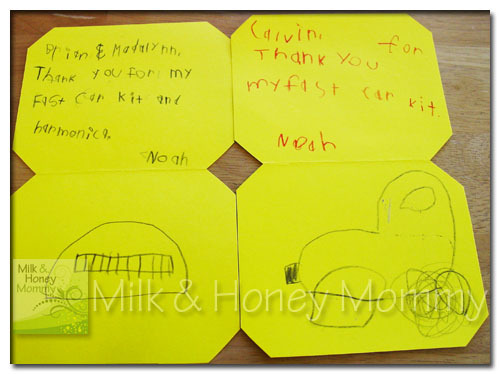 As soon as your child can hold a crayon, start him drawing pictures for his thank you notes. 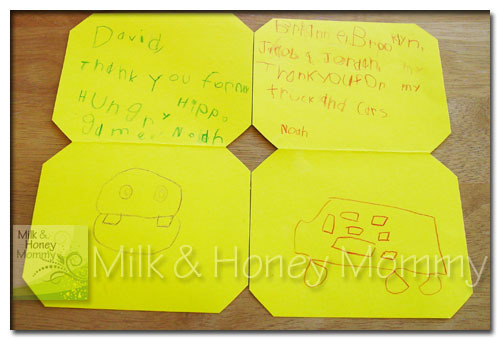 If your child wants to send handmade cards (draw pictures, cut, or glue, etc. ), then let him design his unique card. These will be cherished upon receipt as well as when the child grows older. My grandfather kept many of my handmade cards that were later given to me for remembrance after he died. No one deserves a gift! Just as one should not give to receive, one should also not expect to receive just because they live and breathe. Explain to your child that if someone took the time to give a gift, then they should take the time to thank them. 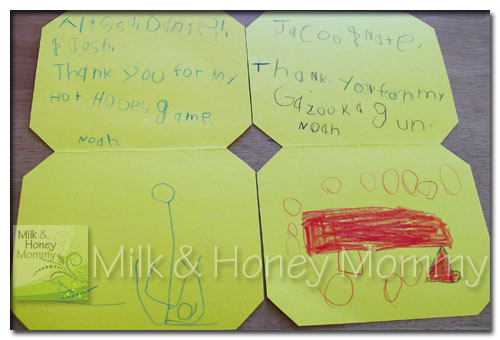 When the recipient receives the note, you want them to not only feel good that time was taken to say thank you, but that the gift they gave was something of true value to the child. Depending upon the age of the child, try not to “write” the note, but guide your child so they include key points in their note. Receiving dictation from a two year old can be quite entertaining. If your child is older, then he should address the giver by name, specifically mention the gift(s), and maybe mention how much they enjoyed the gift or how they plan to use it. There is no need to mention that it is one of many or that they “didn’t really like it.” Instead they can say they “plan to share it with their sister or brother, etc.” Remember to always encourage honesty. When is the last time you hand wrote a thank you note? What was the gift or gesture received?